U.S. home prices have climbed back above the record reached more than a decade ago, bringing to a close the worst period for the housing market since the Great Depression and stoking optimism for a more sustainable expansion. The record caps a four-year recovery from the trough of 2012, when prices sat 27% below the peak after a crash that caused more than nine million American families to lose their homes. 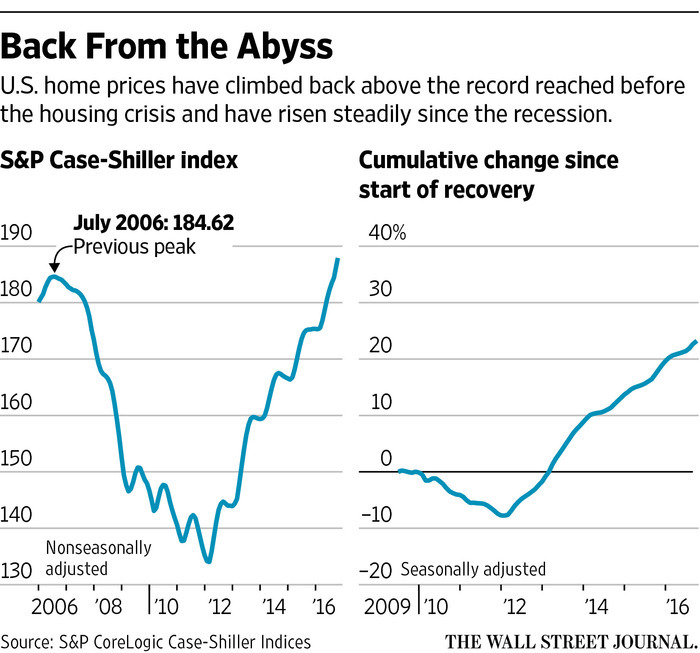 While prices have recovered, the market is flashing caution signs. The country is building far fewer homes than normal, the homeownership rate is near a five-decade low, and mortgages remain difficult to come by, especially for less-affluent buyers. Rising mortgage rates could also begin to pose headwinds to further price growth. Home-price growth has also outpaced income gains, making it more likely that the current rate of appreciation is unsustainable. Home prices have grown at an inflation-adjusted annual rate of 5.9% since 2012, while incomes have grown by just 1.3%, according to Case-Shiller. By contrast, from 1975 until the present, prices grew at a rate of 1.1% a year, while per-capita incomes grew 1.9%. Still, while housing has lagged behind some sectors of the economy in recent years, there are signs of gaining strength: Single-family housing starts rose 11% in October, according to the Commerce Department, and the number of starts remains well below the historical average, suggesting there is room for acceleration. Likewise, the share of first-time buyers rose to 33% in October from 31% a year earlier, inching closer to the historical average of 40%. The lack of first-time buyers had been a drag on the market. Robert Shiller, an economist at Yale University who co-developed the index, said the record provides a significant psychological boost for homeowners, some of whom are finally seeing their homes above water after four years of recovery. About 12% of homeowners who have a mortgage now owe more than their home is worth, down from more than 30% at the bottom of the market, according to Zillow. Some economists are surprised by the magnitude of the home-price gains in recent years, given the more moderate pace of wage growth. There are signs that lenders aren’t making loans to thousands of people who pose little credit risk. Under typical conditions, similar to those in the early 2000s, about 12% of mortgages are at risk of default, but in the second quarter of 2016, just 5% of mortgages were at risk of default. The housing recovery since 2012 has been uneven, often disproportionately benefiting wealthier homeowners and those in some of the largest cities. Such markets are the focus of the Case-Shiller study. Zillow’s home-price index, which covers a wider range of markets, is still 2.7% below the peak. Median home values in urban areas across the U.S. were just 0.6% below the previous peak as of the end of 2015, while median home values in rural areas were nearly 6% below the peak, and those in suburban areas were nearly 7% below the peak, according to Zillow. The slow recovery from the bust in many regions, particularly for lower-value homes, energized insurgent political campaigns by Sen. Bernie Sanders and Donald Trump, culminating in Mr. Trump’s victory in November. Just 34 of the largest 100 metropolitan areas have seen starter-home prices recover to their previous peak, while 56 areas have seen high-end homes reach or surpass previous highs, according to home-tracker Trulia. “Personally I wouldn’t be throwing confetti because my house is worth what I paid for it back eight years ago,” said Nela Richardson, chief economist at real-estate brokerage Redfin. Still, in many parts of the country, a return to near-normal conditions has come as welcome relief, and faster than many expected. The median home value in Lehigh Acres, Fla., on the eastern edge of Fort Myers, bottomed at about $61,000 after peaking at $230,500 in July 2006, according to Zillow. Today, the median home price has risen to about $140,000, and Fort Myers now has a shortage of starter homes, said Mayor Randall Henderson. Meanwhile, the national recovery has allowed longtime homeowners to sell and relocate, making the U.S. labor force more mobile than it has been in years. Dan Tanner, 58 years old, sold his home in Savannah, Ga., in 2007 for just over $300,000, nearly a $100,000 profit in just a few years. He plowed the gains into two condominiums, one in Savannah and another in Atlanta. The value of both homes dropped by 25% within a year. Mr. Tanner eventually sold the Savannah condo at a $30,000 loss, but held on to the Atlanta property. “A friend of mine was like, ‘You made a commitment, you should stick to it,’ ” he said. Now Mr. Tanner plans to sell the Atlanta condo for more than he paid, as home prices in that market are about 3% below their July 2007 peak and 60% above the recent low hit in March 2012, according to Case-Shiller. The recovery also has produced a few big winners. Jeremy Mann, a 31-year-old doctoral student, and his wife, Erin, a nurse practitioner, bought a home in 2011 as the market was bottoming out. “[We realized] we could buy a house now even though we thought that was five or 10 years in the future,” Mr. Mann said. The Manns purchased a rundown building in an up-and-coming area of Chicago for just $310,000, with a $1,600 monthly mortgage payment. The building was big enough for them to rent out several units, covering the mortgage payment. When the couple had the home appraised a few years ago, the value had increased to $425,000. They were able to refinance and use the money for a down payment on a new home, holding on to the original property as an investment. The moves helped give Mr. Mann the financial freedom to work on starting a school for underprivileged children, he said.